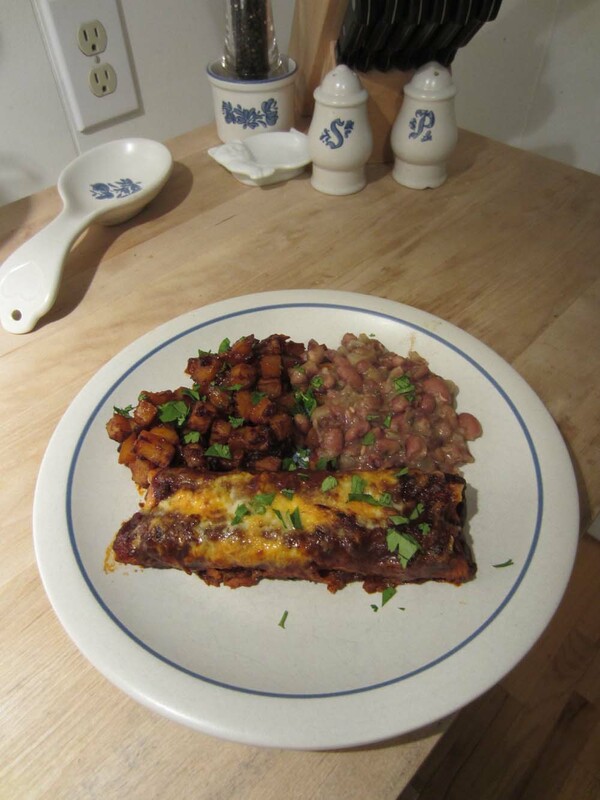 Chicken enchiladas in red sauce, potatoes roasted in red chile, and Anasazi beans in chipotle. The blank space on the plate is for the side salad that I did not make. Weird dreams this morning. I was working for a newspaper (!) again, so I guess it qualifies as a nightmare. So I walk into the newsroom, late as usual, and a receptionist type hands me a note with a short clip attached, whispering in dire tones about some class of tragic typo. Then, since John McCain is sitting in front of this person’s desk for some reason, perhaps awaiting an audience with the publisher, I whip a Three Stooges routine on him, poking him in the chest with one finger and then, when he glances down, flicking his nose. Moving on, I notice that nobody is at their desks. They’re all in the big conference room, and the mood is not evocative of a holiday party. “Uh oh,” I think to myself. And then I wake up. I think maybe I overdid the red chile last night. This entry was posted on December 16, 2013 at 7:31 am and is filed under Cooking, Dreams, Food, Journalism, Newspapers. You can follow any responses to this entry through the RSS 2.0 feed. You can leave a response, or trackback from your own site. Heh, chicken fried rice with twice baked beans and ghost peppers. My eyes were glued shut this morning. Ghost peppers? You’re lucky you still have eyes to be glued shut. Right, blame the chile not the media or its feeder ‘the congress’ . Sounds like a Snoopy “pizza and root beer” dream. Wow, would Love to print that Delicious Photo and eat it for breakfast this morning! YUM ! McLame in a dream? That ain’t wierd, it’s a damn nightmare! Nah, isn’t it the garlic eaters that cause all the trouble? You know, like Larry T? My god that looks good… Out of the roughly eight bazillion things I don’t know how to make and would really like to, a good chicken enchilada has gotta rate right near the top of the list. Whenever I go to a Mexican restaurant I’ve never been in before it’s the first thing I always order. If they can get that dish right, they can make anything is my figurin’. That looks mighty good, but with what was it washed down?